Massive fire. It's still ongoing but the iconic spire has collapsed. It remains to be seen if this ends up being near total destruction. Trump suggests Paris use "flying water tankers" to help put out the fire because dumping thousands of gallons of water on a single building in a densely populated city is the same thing as fighting a forest fire, I guess. Experts said that the president’s proposal would likely make the situation more dangerous. My- It was hard to see the spire collapse. I have a passing knowledge of architecture, and I think it's a truth- this place, with a stone interior, will heat up hotter than any oven you've ever known. This is a great tragedy, for a World Heritage site. And I think it's a huge loss, even if the Parisians don't hit it with Trump-style water from the air. This hits hard. The structure, the tangible artworks (questionable how much could realistically be salvaged)—gone in mere hours. Three family members have been there, and all of them are just devastated to think the beauty they saw first-hand is just gone. I was there as an 8 year old. Impressed me a lot. A loss for the world. When something has lasted for 850+ years it seems indestructible. 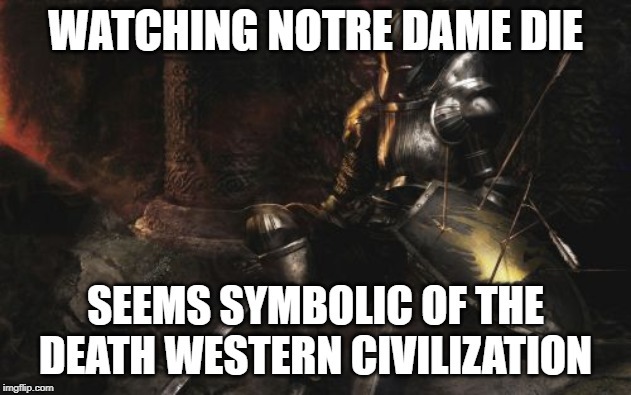 Think of how many lives went on in and around Notre Dame during those years. I'm glad I got to see it in person. I'm so sorry that it happened during Holy Week, even though any time would have been a bad time. Memes have started as you can imagine. These two are actually pretty brutal. It appears much of the stone vaulting is intact!!! What many people dont understand is that, just like a house, a cathedral has a ceiling, an "attic" with support trusses, and then a roof laid on top of that. When you look up, you see the "ceiling," which is the stone vaulting. ABOVE that were the 800-y/o oak timbers (Notre Dame was the LAST cathedral in France that had not had its original roof timbers burned either in the Revolution or the wars) and the roof. THAT is what burned. If the stone vaulting held, the inside was at least partially protected. The hole we see is where the spire (or flèche) collapsed. Edit: until we have a conclusive statement from the titular organists, the curator, or the organbuilder most recently associated with it, we cannot assume anything about the state of the great pipe organ. Edit: officials will meet at 08.00 (Paris) to determine if the structure is stable enough for operations to take place inside. Edit at 08.00 (Paris) - I received a message from Bertrand Cattiaux, the organbuilder who completed the most recent renovation of the organ, that there is still no news on the condition of the grand orgue. Edit: Until the team of expert engineers and architects finish assessing the stability of the building, no one is allowed into the cathedral. Major EDIT!!! : According to a qualified member of the Ministry of Culture (the FIRST reliable, official report we have received), the organ APPEARS to have escaped major damage! A thorough inspection has not been conducted. We will await further details, with hope. Edit: According to Vincent Dubois, one of the titular organists of Notre Dame, the organ is largely preserved!! In these tragic moments for the Cathedral, you have been extremely numerous to send kind words of support, all more moving than the others, either by e-mail, SMS, FaceBook, Instagram or on the phone. I will never thank you enough for that. I would have liked to respond personally to each of you, but given the urgency of the situation, it is unfortunately not possible for me, at least for the moment. I hope you’ll understand. Notre-Dame, who had resisted revolutions and wars, burned in a few moments. 855 years destroyed in four hours ... Like you, I feel terribly sad, with contained rage, total sorrow. The images that we have seen are horrible. How not to think that we are in a bad dream? Reality comes back to us, unfortunately. Despite all the damage in the Cathedral, the organ miraculously escaped the flames, as well as the water supposed to extinguish them. It is very dusty, but will continue to enjoy us as soon as the building will be restored. When? No one knows yet. « Destroy this temple and in three days I will raise it up. » (John, 2). 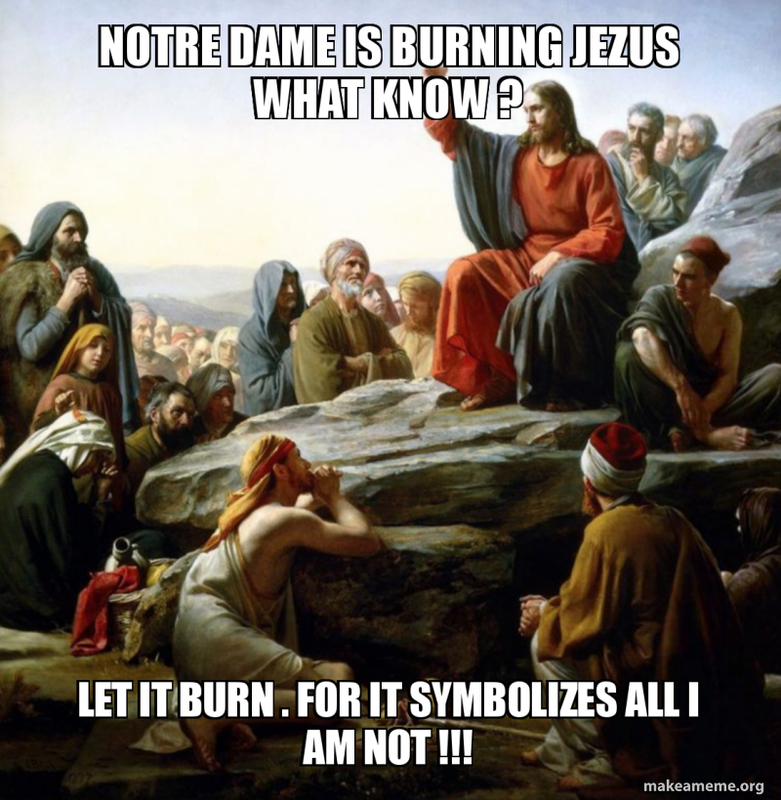 It will surely take more time in Notre-Dame, but I still live with great confidence and hope. They've already raised $1B for repairs and restoration. I heard this AM that most of it was from major corporations so this number will most definitely climb as they make a more general plea for donations. Interestingly on the news this AM they made note that nothing has come out of the Vatican other than basically "thoughts and prayers." Maybe they should sell a few precious works of art they have stashed away to help restore a precious work of art ordinary people can actually see. Another view that restoration of the cathedral is not one of the better causes you could be donating to.